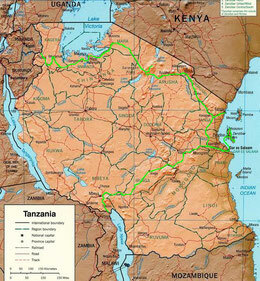 2,219 km of cycling - as part of a bicycle world trip - from the border with Rwanda to Lake Victoria, on safari by off-road vehicle across Serengeti National Park and to Ngorongoro Crater, then by bicycle again past Kilimanjaro eastwards to the coast, by truck to the capital Dar es Salaam, by boat to Zanzibar Island, then southwestwards via Mitsumi National Park to the border with Malawi. 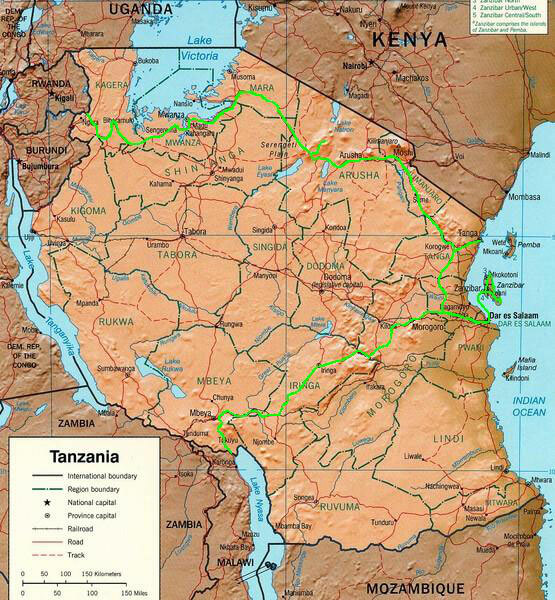 Do you like Cycling Tanzania? Having paid 50 US dollar each for the visa, for five days we cycled on mostly rough dirt roads eastwards to Mwanza at Lake Victoria. Very much further we wouldn't have made it anyway as east from here the vast and treeless plains of the Serengeti began, probably one of Africa's most legendary places. Home to millions of hoofed animals and as well lions, cheetahs, leopards, hyenas, zebras and giraffes. And exactly because of this we wouldn't have made it by bicycle (at least not alive...) through there. Fortunately we ran into Tal and Shlomi from Israel and Jayne from Australia and together we organised an off-road vehicle with driver and went on safari through Serengeti National Park and Ngorongoro Crater Conservation Area for two days and one night, for which we got painfully hefty charged. But what we saw was simply amazing. We were lucky and in fact found several lions, even a mother with young lions. And it was simply breathtaking to have a close-up eye contact with a wild lion! It was just for a couple of seconds, but they had been unforgettable. Together with our driver Ken we cruised through this amazingly beautiful savannah the whole day. We saw hippos, lions, gazelles, crocs, buffaloes, giraffes, zebras and cheetahs before pitching our tents in the evening right in the middle of the park. Having been to the port twice, talked with the captain of a cargo ship and actually arranged everything, we then on the third day were about to enter the ship, but even at the port entrance they didn't want to let us in anymore. The highly annoying fight against corrupt port staff, just waiting for a decent bribe, was ready to start. For hours we discussed, argued and played a stupid game with and against port security guards, the immigration and the port management, getting ourselves closer and closer to our ship. When eventually everybody had realized that there was no single dollar to get from us and that they probably wouldn't get us out of the port premises without heavy force, the port management just said that they would have never seen us... So finally we could get started, at least that was what we thought. But unfortunately our ship was still waiting to get loaded and somehow all the others more or less as well. However, we waited in one of the empty containers, trying to avoid the heat outside. After hours of waiting and in the meantime checking the ships again and again we were fed up with all this hassle. We were neither keen on spending days in this port nor on cycling all the way to Dar es Salaam before finally getting on the beach. So we packed our stuff and tried to find a truck for a lift to Dar es Salaam. At a nearby cement factory we waited until late night for Singh getting loaded with his 40 tons of cement, packed our bikes on top and eventually we got started. Next day we finally found ourselves on the passenger boat to Zanzibar Island! Having spent one day in Zanzibar Stone Town with its narrow lanes we cycled to Nungwi in northern Zanzibar, where we finally got our jump into the crystal-clear turquoise coloured water. After three days of relaxing under palm trees we moved to Bwejuu Beach at Zanzibar's southeast coast, where we, rather surprisingly at this expensive island, found a real bargain: We based ourselves in a brandnew bungalow with seating on the second floor with awesome views through the palm trees to the Indian Ocean 70 metres away. Actually we got everything just for ourselves: the white-sand beach, the wooden beach chairs under the palms and the tiny beach restaurant which served us octopus in coconut sauce in the evening. The last days in Tanzania we cycled up into the southern highlands, passing endless savannah and plateaus before descending 1,700 metres down to the Malawi border.